Home » Products » Products » DCCS » DCCS "Dashboard"
Like the dashboard in your vehicle, you can check the vitals. With DCCS Activity Status you have a way to view valuable information in a snapshot, without having to generate a report. 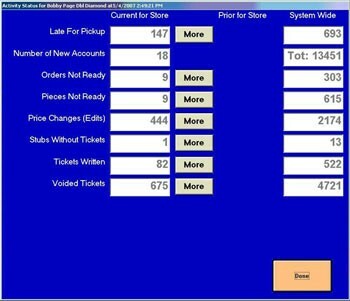 The Activity Status screen can display customer accounts, cash drawer totals, orders due and overdue, orders not yet marked in, sales reporting plus further customized information.